A warning: The book blurb and the review contain some spoilers for the first book in the series, The Way of Shadows, which I reviewed earlier this month. Let me start off by saying that I read Shadow’s Edge in one sitting. Once I started it, I couldn’t put it down, which means I went to work the next morning on three hours of sleep, but pleased. I was simply hooked. 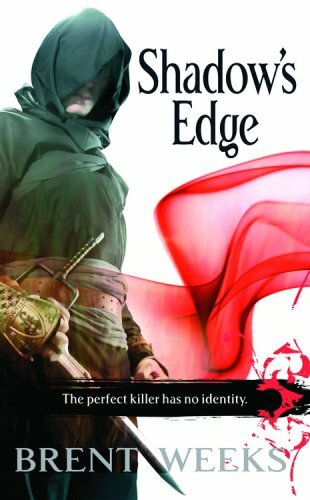 Shadow’s Edge is book two in Brent Week’s Night Angel trilogy. It picks up shortly after the first book, The Way of Shadows, and we find Kylar struggling to to find a way to be the man he thinks he should be (a family man, definitely not an assassin) even as the life he’s always known–the life of shadows and killing–calls to him. He wants nothing more than to start over and be a good man. As far as he’s concerned his life in Cenaria is over. Logan is dead, Durzo Blint is dead, and the Godking has taken over the throne. Of course, nothing is that easy, and it’s not long before Cenarian politics comes knocking on Kylar’s door, forcing him to choose between this new life, which is full of promise, and the old one, which is full of death. Sometimes I get the feeling, reading these books, that Weeks sat, thoughtfully, and said “what’s the worst possible thing that could happen to Kylar right now?” and then ran with the answer. The story isn’t just about Kylar and his challenges, however, but about the other characters we started to meet in book one. Elene, Logan, and Dorian all get face time, as do characters we barely touched on, such as Viv. If I didn’t know this was a finished trilogy, I probably would’ve wondered if I was at the beginning of another Wheel of Time, with all the head-hoping and political maneuvering going on in the story. If I look at it objectively, I can’t tell you why the Night Angel books have hooked me so thoroughly. There’s nothing ground-breaking, and I’m not wrapping my head around social commentary or deep thinky thoughts…but I am wholly and completely entertained, and I am invested in Kylar’s continued development as a character, though the wider fate of the world he lives in I don’t care about so much. These books are plot heavy and fast moving, but it is Kylar (and to a lesser extent the other characters we’re getting to know) who keeps me coming back. He’s wholly different from me, but Weeks has written him as so accessible that the grossly different life expereinces don’t matter. Now here’s to hoping the library has book three, Beyond the Shadows, available. This entry was posted in Book Review and tagged book review, fantasy. Bookmark the permalink.